This book makes a style choice and really commits to it, and by and large succeeds. Daisy Jones & The Six is the oral history of a fictional American rock band in the 1970s, and entirely structured as such. Interviews, with the interviewer removed – different people’s voices telling their part of the story one paragraph at a time, stitched together to make a whole. And damn if it isn’t compelling. This is the story of how a band is made, how a band skyrockets, and how a band falls apart. 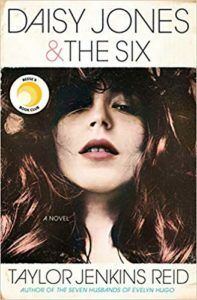 Two brothers form a small duo and gradually add four more, becoming a moderately-successful indie rock band called The Six. Rich, beautiful, and talented Daisy Jones wants to be a songwriter but is only being pushed as a pop act. They share a producer who wants to add her voice to a song The Six (well, really, front man Billy Dunne) has written and from this a hit is born. It’s a solid story about ego and addiction and dueling personalities and living hard and fast and in the spotlight. Clearly there are two main characters (Daisy and Billy) and the rest more or less exist to support them, and only a few of them manage to stand out in any way. Keyboardist Karen makes a mark as one of the few women in rock and roll, as well as Billy’s brother Graham who’s mostly along for the ride and wishes he and his brother were closer. The rest, especially because of how the book is styled, fall pretty easily into the background. But I found myself wishing this band was real – that the performances described were things I could go look up, grainy and out of sync and all, on YouTube. So they just exist in my head. Postscript – oh damn, Reese Witherspoon already picked up the rights to this and it’ll get a 13-episode run on Amazon. I am so genuinely looking forward to the casting, and how they decide to structure it. Share the post "I wish this was a real band"